Two decades on, ten ways in which the service transformed the way we watch TV. On 1st October 1998, a new era for UK television dawned with the launch of Sky's new digital TV service. With it came a number of changes that many viewers now take for granted. 1. You could now receive the main terrestrial channels on satellite for the first time. Sky's previous analogue service was already multi-channel, but in order for viewers to be able to watch the four main terrestrial TV channels, they had to switch back to analogue terrestrial television. This began to change with the launch of Sky Digital, with the availability of the BBC's channels, albeit without the full regionality of analogue TV. Channel 5 had been on analogue satellite since its launch in 1997 and made the transition across to digital. Channel 4 became available on satellite for the first time. But ITV, whose main shareholders at the time, Carlton and Granada, were preparing for the launch of a rival terrestrial-based digital TV service, was absent until 2001. Due to a lack of regional options on BBC One and BBC Two in the early days of Sky Digital, viewers received "UK Today" instead of their normal regional programmes. Any TV set now contains one of these - but back then it was a novelty - for the first time, your receiver would provide detailed listings. Until the EPG became commonplace, viewers either had to use a paper-based TV guide or check out TV listings on teletext. There's quite a debate about whether +1 timeshift channels are still needed in an era of PVRs and on-demand TV. In 1998, Discovery was the first channel to offer programmes on an hour delay via Sky Digital. Discovery+1 debuted on Sky channel 532. Sky Digital started up on the new Astra 2 satellite service, based at 28.2E, which meant new mini-dishes. The original mini-dishes were smaller than the current generation, and generally more opaque than the ones now being installed on houses. Prior to the switch, larger white, round dishes were being installed - which needed to be quite big north of the M62 to ensure good reception. Early adopters had to remember to keep their new Sky Digital boxes connected to a phone line in order - breaching this could cost subscribers up to £188, according to some of the marketing material available at the time. In the year following the launch, Sky started to offer a rather primitive interactive television service. Open launched in August 1999; Services included shopping at retailers including Woolworths, as well as email, gaming, banking and information services like film guides or weather. Launched in 1997, News 24 was only on cable until the launch of Sky Digital, as well as overnights on BBC One. The launch on Sky provided a massive boost in reach, but brought to an end the rather experimental format of the first year on-air, when there were relatively few viewers. A week before Sky Digital went live, the BBC launched another digital channel: BBC Choice. It later was later replaced by BBC Three. A year later, the BBC launched BBC Knowledge, which was replaced by BBC Four in 2002. Sky Digital and other digital TV services that followed enabled broadcasters to adopt 16:9 widescreen transmissions. The BBC was among those early adopters, although a special compromise format - 14:9 - was used to ensure existing analogue TV viewers and users of 4:3 TVs didn't have to put up with large black bars at the top and bottom of the screen. The BBC Widescreen Digital Test Video, produced in the summer of 1998. Used again 2013-2016 to test additional Red Button streams on digital satellite. Twice a year, usually around late February and early October, the sun's position in relation to the satellite resulted in weak signal. Interference was manifest in the form of 'sparklies' which filled the screen, at times completely swamping the programme you wanted to watch. Sparklies were also present in times of bad weather, or where the dish was misaligned or too small for the area it was installed in. Some transponders were worse than others for this type of interference. 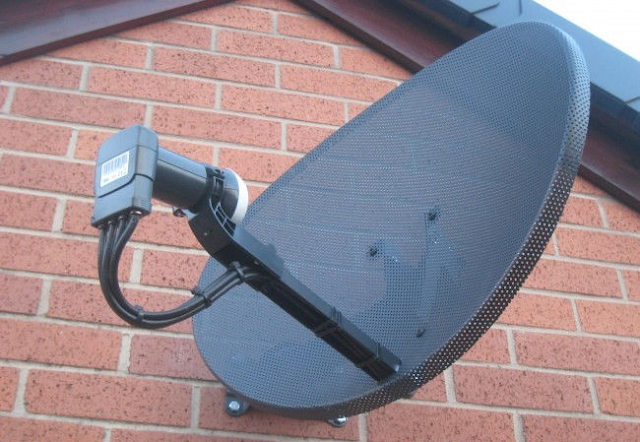 Sparklies were a thing of the past with Sky Digital - although outages now manifest themselves in pixelation or complete signal drop-outs. It would be another ten years before a free-to-air satellite service, Freesat, went on-air. Although a viewing card system was developed to give viewers free-to-view access to the main channels, Sky ultimately enjoyed a monopoly on multi-channel television, only dented by On/ITV Digital, which went bust in 2002 and cable companies NTL and Telewest - but neither had anywhere near the same geographical coverage as Sky. Only the mass uptake of Freeview and the digital switchover helped even the digital TV playing field.